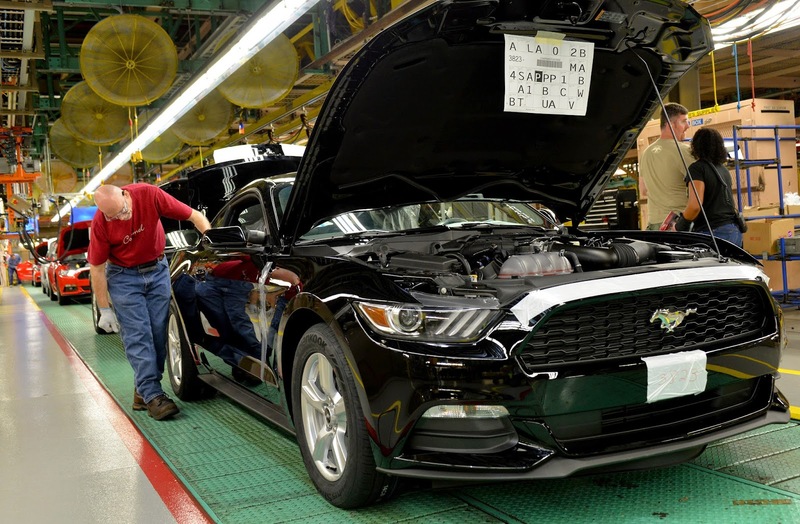 The highly anticipated, all-new Ford Mustang rolls off the line today at Flat Rock Assembly Plant, marking production of the sixth-generation pony car. For the first time in its 50-year history, Mustang will be available globally to customers in more than 120 countries around the world. 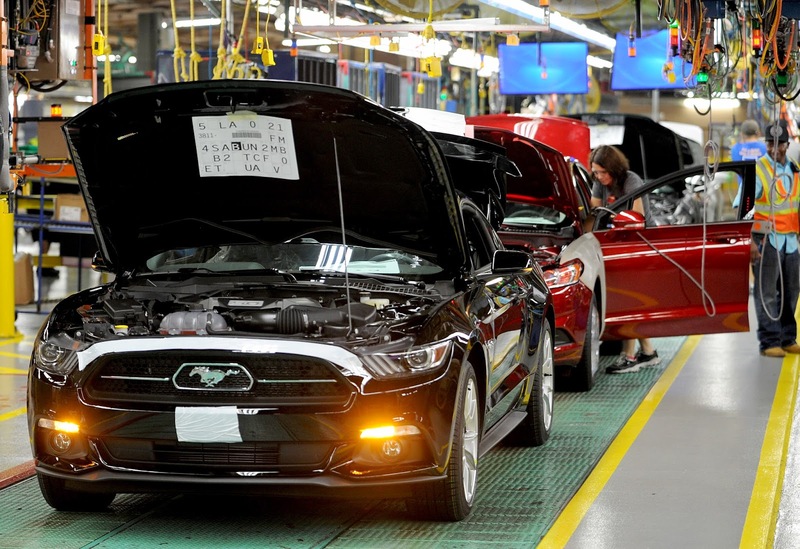 The addition of a right-hand-drive Mustang to Ford’s global vehicle lineup will allow the iconic pony car to be exported to more than 25 right-hand-drive markets around the world, including the United Kingdom, Australia and South Africa.“Mustang is and will continue to be an automotive icon,” said Joe Hinrichs, Ford president of The Americas. “Expanding its availability globally affords our customers around the world the opportunity to have a true firsthand Mustang experience – one unlike any other.”In April, Ford celebrated the 50th anniversary of the original Mustang. In commemoration of this, each 2015 model will be adorned with a badge on the instrument panel that includes the galloping pony logo and the words “Mustang – Since 1964.”Mustang’s impact goes well beyond the more than 9.2 million cars sold in its 50 years of continuous production. It has made thousands of appearances in film, television, music and video games, and is the most-liked vehicle on Facebook, with close to 8 million likes. The way Mustang looks, drives and sounds is key to the visceral experience that makes drivers want to get in and hit the open road. The clean-sheet design of both Mustang fastback and convertible evokes the essential character of the brand, retaining key design elements – including the long sculpted hood and short rear deck – in a contemporary execution. With more options to choose from, there is a Mustang to fit any lifestyle. The upgraded V8 is joined by a 3.7-liter V6 and an all-new 2.3-liter EcoBoost® engine that brings state-of-the-art technology to Mustang.Mustang GT continues with the latest edition of the throaty 5.0-liter V8 – now featuring upgraded valvetrain, new intake manifold and improved cylinder heads – that yields 435 horsepower and 400 lb.-ft. of torque.The Mustang 2.3-liter EcoBoost engine uses direct injection, variable cam timing and a twin-scroll turbocharger to deliver the performance Mustang drivers expect with an output of 310 horsepower and 320 lb.-ft. of torque. When life throws drivers a curve, the all-new Mustang sets new handling benchmarks for the brand, delivering world-class dynamics and ride quality.Mustang features all-new front and rear suspension systems. At the front, a new perimeter subframe helps to stiffen the structure while reducing mass, providing a better foundation for more predictable wheel control that benefits handling, steering and ride.At the rear is an all-new integral-link independent suspension. Geometry, springs, dampers and bushings are all specially tuned for this high-performance application. New aluminum rear knuckles help reduce unsprung mass for improved ride and handling. In the last year, the plant has been transformed. As part of a $555 million investment, it has added a state-of-the-art, fully flexible body shop to allow multiple models to be produced on the same line, supporting Ford’s flexible manufacturing efforts. Other technologies recently incorporated at Flat Rock include three-wet paint process, dirt detection and laser brazing. In addition to Mustang, Flat Rock Assembly Plant also produces Ford Fusion. The facility has approximately 3,000 employees working two shifts at full line speed.